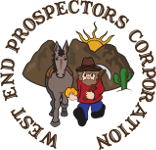 Yellow Gopher | West End Prospectors Corp.
Yellow Gopher is located in Coolgardie, 12 miles north of Barstow, CA (18 miles by road) on BLM land. There are no facilities in the area. Campfires and stoves are allowed with a California fire permit. Yellow Gopher is a desert claim. Relatively flat, with sandy washes, sandy roads. Mostly fine gold with pickers and multiple gram nuggets. Plenty of camping areas for large motorhomes and trailers. Access is easy with 2wd vehicles. Multiple secondary roads and trails which allow easy access to all of the claim. Drywashing is the preferred method of mining on this claim. There are large potato size hematite, making metal detecting a challenge. The area contains a lot of caliche. Be aware of shafts on the claim and in the general area that tunnel through and under the solid caliche. In the summer cover your panning tubs as the bees will be attracted to the water. There are times when circulating sluices are unusable to to the bees. Cellphone coverage is extremely spotty to say the least. The best coverage is on a high vantage point where you can see California City to the west.